If you are in the process of starting a new business, or if you are an existing business and you have a new product or service, you need to find a way to tell the world about this. Press release services are the most important tools you have in terms of being able to achieve this. By making sure that your press release is written correctly and sent to thousands of people across the globe, you know that your message will be heard. If you can also release your information on the various social media networks, you really are onto a winner. However, you have to make sure that you know how to write a press release that will have an impact. You need to understand how you can focus on a single news-worthy item and how you can tell the world about this in an engaging way. This is something that takes skill, which you can learn. Once you have written your press release, however, you need to make sure that you also get that release out to the world. This is what a press release service is able to achieve for you. 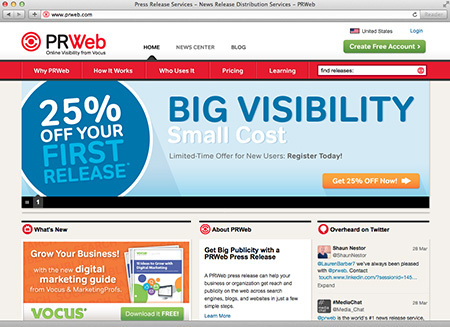 PRWeb is one of the most popular press release services available today. They have been on the market for nearly a decade and are still getting stronger. PRWeb does everything in their power to make sure your press release is seen everywhere. They have a huge database of local, national and international news sources. As such, they can make sure that you actually get the reach and publicity that you require, utilizing search engines, blogs, websites, magazines and more. They have a great understanding about the importance of your information, while at the same time understanding that not everybody is a journalist and knows how to get information out there. PRWeb uses a simple, but incredibly powerful system. Whenever there is something that you want to announce, be that a new business, a new product, a conference or anything else, you write your press release and PRWeb gets to work on making sure it gets out there in the world. To achieve this, you firstly choose the package that is right for you. You are then given a number of templates to work from, which means you immediately know you have delivered your content in the right manner. Simply submit the template and then PRWeb then gets to work on it so that it goes where it should go. PRWeb is very customer friendly. They have a telephone number that you can use if you want to speak to someone directly with any queries you may have. Additionally, they also have an easy to use contact form on their website, which can be used both by members and non-members. This is really handy for those who are unsure about whether or not to choose PRWeb, because it allows them to have any questions answered first. Easy submit options, which is basically a one-click press release. The ability to choose priority distribution, if you ever have to send out something urgent. News revisions, if something has been done in error if you want to release a change. News drafting, which is particularly beneficial for those who don’t have a lot of experience in the world of press releases. Search engine optimization, which means that you are able to generate far more traffic to your website. Additionally, you can track how much your news item has been seen and what has happened with it since then. Hence, you know where people who are interested in your product or company are coming from, allowing you to target them more strongly in future. PRWeb is incredibly user-friendly. Once you have created your news item, regardless of what that is, you can create a piece of text to announce this. Perhaps you have a new member of staff, perhaps you have a special offer on, perhaps you have changed your website or anything else that you consider newsworthy, and this is what you then work on. All you need to do is write your press release and it will get distributed straight away by PRWeb. Consider that they currently have over 250,000 subscribers and their database also contains over 30,000 bloggers. Additionally, the website is visited by 3 million different people each and every month, which shows just how far your reach will be. PRWeb is one of the most social shared press release websites in the world. This allows them to have a tremendous reach. They also have a strong presence on LinkedIn, Twitter and Facebook. $99 for a basic press release, which is then added to the PRWeb site itself, as well as on other news sites. It can also be picked up by search engines. $159 for a standard press release, which is shared across social media as well. $249 for an advanced press release, which is optimized for you and goes to all important news outlets. $369 for the premium press release, which goes to high end news sites and also allows users to add videos and other multimedia to their press release. $499 for the financial package, which links you to public traded companies, as well as sending your release to financial sources. Creating an account with PRWeb is completely free. PRWeb really stands out from the crowd, and that’s not only because they have partnered with the Associated Press (AP). They have various packages that allow your press releases to be sent through the AP on top of their standard PRWeb contacts, for even further visibility across a wide range of websites and search engines. The PRWeb packages have a fantastic social media reach and PRWeb also has a huge database of contacts within their own database. Thanks to this, your press release will be seen by a huge audience of different people and news outlets, allowing it to have a maximum impact. One of the things that sets PRWeb apart from other press release websites is their user friendliness. They understand that regular business owners are not journalists, or even writers, and therefore offer full support through such services as news drafting to help you through their processes. I fully recommend PRWeb as they are one of the better press release services on the market, also due to the fact that they are highly affordable thanks to their various package selections available.